I was in search of a really good facial collagen stimulating serum and I came across this free 15 piece Ulta set with an Ulta brand purchase. I’m sad to say that I have never tried anything from Ulta’s line, although I have read some really good reviews, so this was the perfect opportunity. 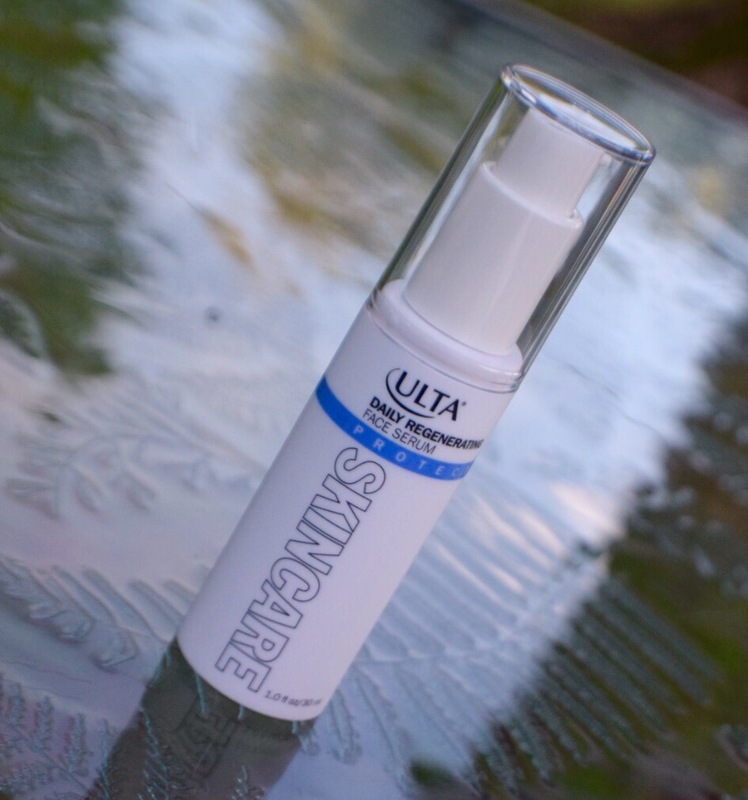 I purchased the Ulta Daily Regenerating Face Serum which uses Advanced Protection Factor (APF+) and claims to reinforce collagen, enhance skin elasticity, even skin tone, and visibly brightens your face. The directions are to apply to the face following cleansing and any other treatment. I planned to use this before derma rolling. My first impression was that I loved the texture of this serum and probably because it’s not a typical serum consistency. It’s more of a cream and it blends so well that a pea size amount covers my whole face. It’s absorbs quickly with no greasiness/dryness. The pump puts out the perfect amount to cover the face. The smell isn’t overbearing but it does have an apple & licorice aroma coupled with a clean laundry type smell. I’m sorry but that’s the best way to explain. I have seen reviews that said the smell was awful. For me, it’s a very mild smell that I personally like. It’s actually moisturizing enough that I don’t need to apply a moisturizer on top. That’s not to say you shouldn’t if you have extremely dry skin then you can apply a moisturizer. Usually a serum leaves my face feeling like plaster and I desperately need a moisturizer so this was a definite come up. The effects have been subtle so far and I’m not claiming any miricles here. My skin is more hydrated, a tad brighter, and the fine lines around my eyes have become less noticeable. Ulta’s entire makeup & skin line is reasonably priced. This serum retails for $13.99 USD and, compared to most serums, this is cheap. Bottom line is that I would absolutely recommend you try this serum. I do plan to purchase again. I was really excited about the free 15 piece Ulta set because it gave me a very wide range of products to experiment with. It sort of felt like christmas as a teenager, when a family member would get me the makeup set from one of the major department stores. For some reason that gift always excited me the most, no matter what brand it was, and is probably what ultimately contributed to my beauty obsession. lol. 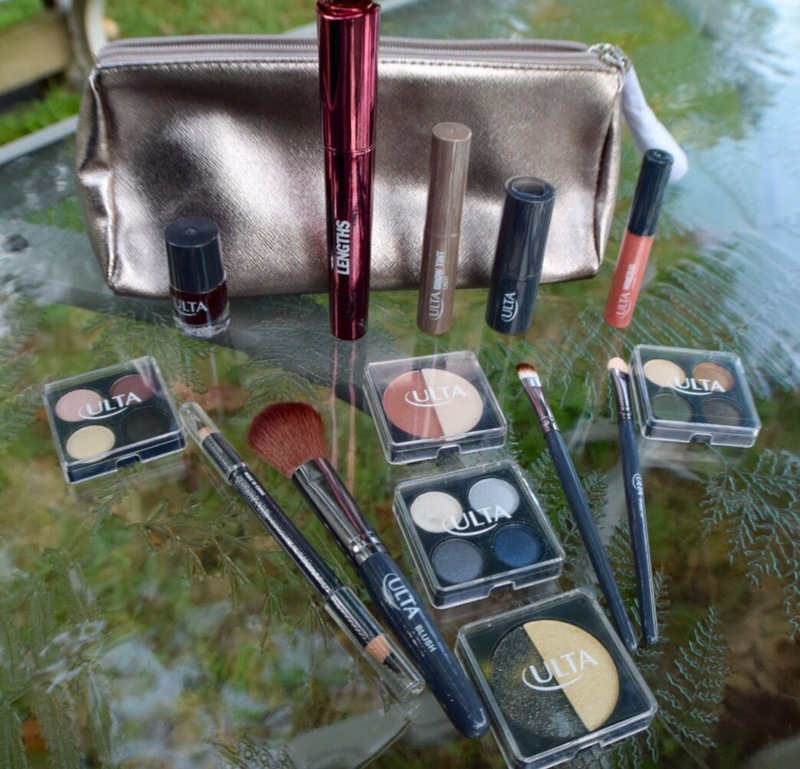 Ultra gave you the choice of receiving this set in amethyst or champaign colored makeup bag. I opted for the champaign bag. These brushes aren’t the greatest but they will get the job done in a pinch. As you can see they included the bag and coupon as part of the “15” and it’s a little deceiving but how can I be upset when it’s free? Actually I will put this coupon to good use at my next Ulta visit. Hope you enjoyed this little review and haul. Next Stila Art Of The Fine Line: Review and GIVEAWAY! CLOSED!